Night Photography is an art form that has really only begun to see its full potential with the invention and progression of the digital camera. With film the world of star and night photography was often a guessing game at best, with each exposure taking many hours to attempt…and only after the processing would one know if they had timed the exposure correctly. Now technology is such that night photography is not only easier, it’s actually fun! 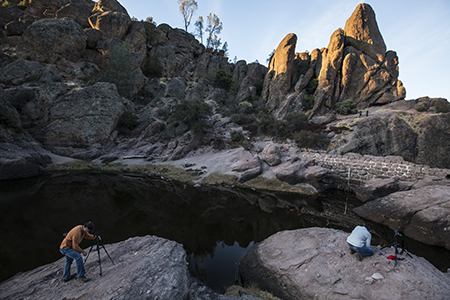 I met a group of 4 awesome folks for a night of exploring Pinnacles National Park in search of capturing some images of the night sky we could use the following day during a post-processing lecture. Our adventure begins with a crazy hike to the Bear Gulch Reservoir. 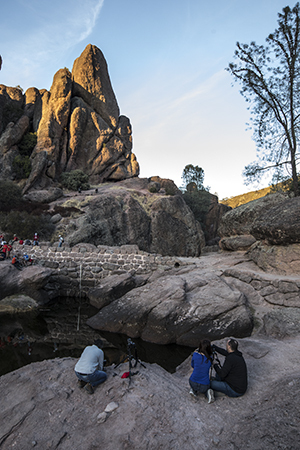 This hike takes us up and through varied foliage, rock formations of various hues, and even down through a couple of the caves that help give this park its wonder. 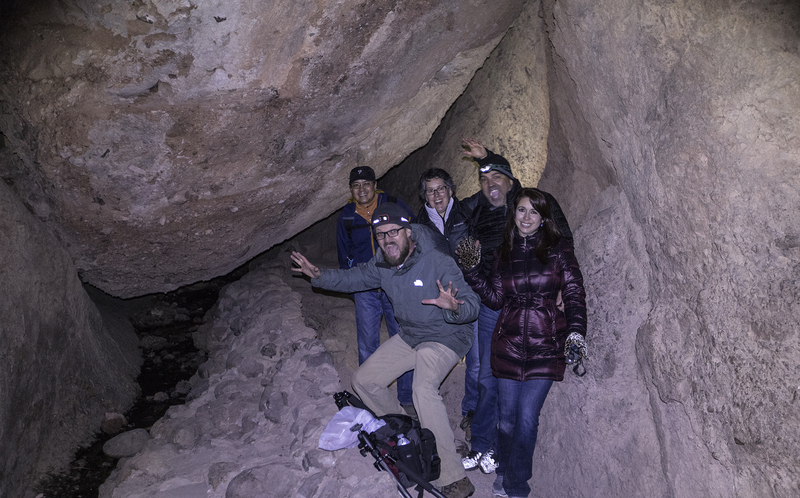 Some of these caves are filled with bats, and fun to explore as well. 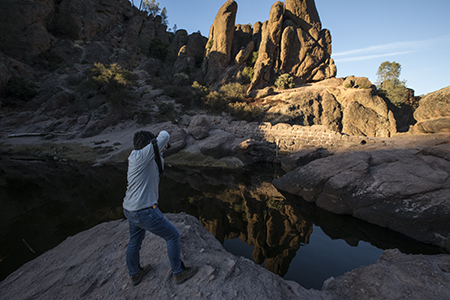 We stayed to the main trail and wound our way to the edge of the reservoir where we had a pristine view of the clear skies, and iconic rock formations. While we waited for sunset we made fun of the local boyscout troop who had shown up on scene. We didn’t really make fun of them, but we really hoped they were merely passing through, and not planning on staying for long. Thankfully they made their way out of our scene and allowed us to set to finding our composition for the night. When it comes to setting up for a night shot I like to scout my composition early so I can take a shot at twilight at a lower ISO and higher Aperture than will be used once it gets dark. Then in processing I can come back in and add this higher quality image with the stars to give an overall higher quality image. The only downside to this is that it a) requires a bit more processing and b) keeps you locked in on one composition for most of the night. 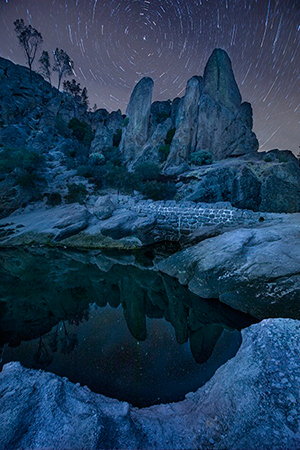 Once everyone had set their composition, and taken a few shots of the composition at twilight, it was time to wait for the stars to come out…and nowhere else so close to the busy bay area can one see so many stars than here in Pinnacles. SO AWESOME! We had a great time telling tale while we waited for our hour of exposures to finish. Once that was done it was time to crack off a few more shots of pinpoint stars to see how they compared to our earlier attempt... and then hike out and brave the crazy caves in the dark. That is always fun! With the recent daylight savings adjustment we were back to the gallery by 11pm and ready to get a nice night of sleep before our morning processing session. The processing part is where ones creativity can shine through. I walked the group through the ways to process the images to showcase the startrails, and then different adjustment layers that could be added to really bring out the best of the images. We also learned how to composite the images we took at twilight to help give a better depth of field and overall quality. I really liked the different takes each of the group brought to the scene…so fun to see how creativity and artistic expression are played out in a scene we all witnessed together. Overall it was a very successful evening of adventure into the Darkside of photography, and I look forward to the next adventure.